Allow us to introduce the annual Tihar Festival, or Nepal’s version of Diwali, a five-day celebration that honors gift-giving, storytelling and strong relationships. 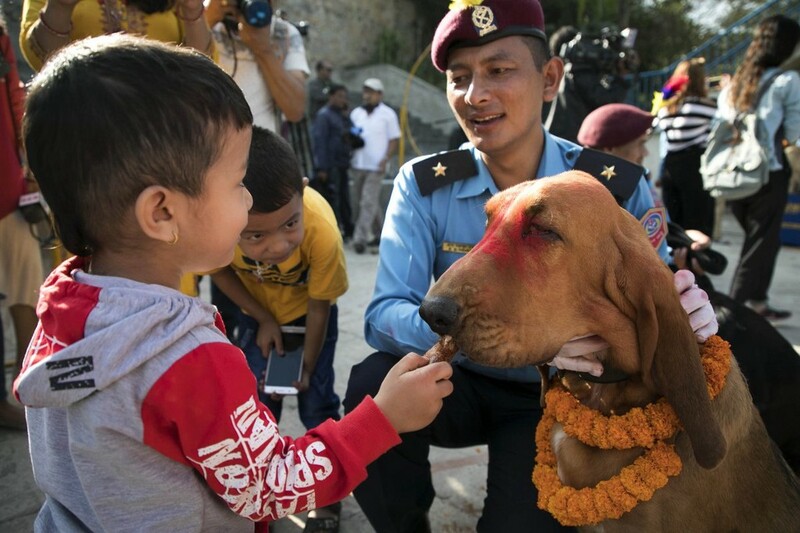 And because there’s no stronger bond than between man and dog, Tihar’s second day, Kukur Tihar, is dedicated to thanking pets and strays alike for their friendship and loyalty. Get the tissues now, because it only gets cuter. Hindu culture has praised dogs long before the internet dubbed them doggos. In the ancient text of the Mahabharata, king Yudhishthira refused to go to heaven without his faithful dog in tow. Locals hang flower garland around dogs’ necks and paint red marks (or tikas) on their furry foreheads. Oh, and they dish out treats. Lots and lots of treats. Without further ado, here’s a bunch of pictures from what is probably the world’s cutest celebration. You’re welcome.